Season pork cubes with salt and pepper. Heat oil in large Dutch oven and sauté pork in batches until nicely browned on all sides, about 5 minutes. Transfer pork to a plate. Stir in onion, chiles and garlic and cook, stirring, for 2 to 3 minutes, until onion is soft. Add pork back in along with broth, cilantro, zest and juice. Bring to a boil. Simmer, uncovered, stirring occasionally, for about 1 1/4 hours, until meat is fork-tender and liquid has thickened. 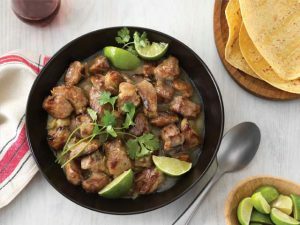 Serve garnished with lime wedges and chopped cilantro with warm tortillas and black beans on the side.